Last week, the kids and I went to the Farmers Market for the first time this season. It is very early in the growing season, but there were a few greenhouse grown tomatoes on hand. They were giant, heirloom varieties in beautiful colors. The tomatoes were packed with flavor, had few seeds, and were perfectly ripe – such a welcome change from the grocery store variety that we’ve been eating for the past few months. Seasonally available tomatoes are such a treat that I wanted to make something that would bring out the full flavor. I diced the tomato, added some lemon juice and threw in some herbs from the garden. Originally made to top asparagus (that recipe will come another time), I was lucky enough to have some of the tomato mixture leftover the next day. 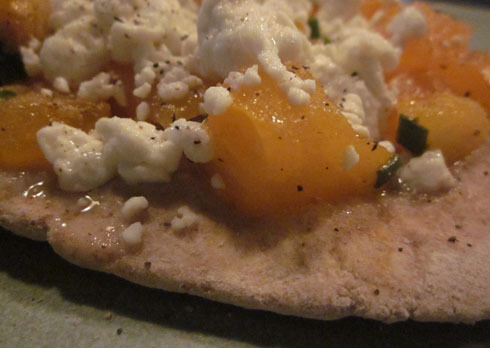 I added a scoop to a pita, topped it with goat cheese, and baked it until the cheese was just melty. It was delicious. This mixture is very versatile – use it as a pizza topping like I did, place it on sliced baguettes for bruschetta, spoon over grilled vegetables, or eat it straight out of the container. As written, this recipe is both low-calorie and dairy-free, which could change depending on how you use it. Chop tomato into 1/2” cubes and place in bowl. Add remaining ingredients and stir to combine. Let sit at room temperature for 1-3 hours. had to try comments…never added chives to mine, will try! Your food photos always make me hungry!